Created in 1990, IRIT (the laboratory in Computer Science of Toulouse) is one of the main French research centres in Computer Science with 700 members (among which 272 researchers and faculty members, 204 Ph.D. students, 50 post-docs, 32 engineers and administrative staff). 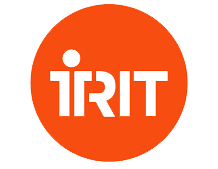 IRIT is supervised by 5 academics institutions: CNRS (Centre National de la Recherche Scientifique), INP (Institut National Polytechnique de Toulouse), and the 3 universities in Toulouse: UT3 (Université Toulouse 3 Paul Sabatier), UT1 (Université Toulouse 1 Capitole) and UT2J (Université Toulouse Jean Jaurès). Research at IRIT covers most of the issues and domains in Computer and Information Science, from system design, security, formal checking, software engineering to networks, computer vision, image analysis, multimedia management, human-system interaction, data science, machine learning and AI. Strategical applications area include Health, autonomy and care; smart cities and IoT; applications in aeronautics, space and transportation; social media, digital social ecosystems; heritage and people safety. Irit has benefitted from many contractual partnerships with companies and institutional partners, through national and European joint projects (annual average of 100 funding contracts). Nathalie AUSSENAC-GILLES (IRIT-CNRS) is a senior researcher at CNRS and she has been working at IRIT since 1991. She is one of the heads the MELODI group and coordinates activities related to Big Data and Data processing at IRIT. Her research deals with knowledge engineering (KE), semantics in natural language processing and methods to build and populate knowledge bases and ontologies. She works on the design of models and methods for knowledge extraction from text and semantic annotation. Her work has been applied in areas as diverse as archaeology, car diagnosis, cartography, Earth observation or scholar paper analysis. Catherine COMPAROT (IRIT-UT2J) is an associate professor at Université Jean-Jaurès in Toulouse (UT2J) and researcher at IRIT in the MELODI group. Her works deal with the semantic web, and more specifically with ontology building, enrichment and population using various sources (e.g. documents, web sites, open data) and with semantic information annotation and retrieval. She works on domains such as business intelligence, botany, and earth observation. Cassia TROJAHN DOS SANTOS (IRIT-UT2J) is an assistant professor at Université Jean-Jaurès in Toulouse (UT2J), and researcher at IRIT as member of the MELODI group. Her research interests are ontology matching, data integration, query rewriting, and knowledge extraction from text to build and populate ontologies and knowledge bases. She is one of the organizers of the annual OAEI challenge on Ontology Alignment. She has been working in the design of ontologies for semantic integration of Earth observation image metadata and contextual data.